Rated 5 out of 5 by Mariegvega from Great products I bought tree times here and I’m so happy. 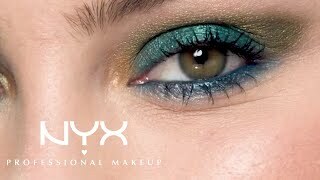 I so in love with nyx makeup. Rated 5 out of 5 by ddprap4 from Amazing Pallette! I bought this a few months ago and it is my go-to pallette! I absolutely love the colors & they blend very well! LOVE THIS!! Rated 5 out of 5 by Nbrown1941 from Beautiful & Pigmented Colorful Palette! This palette is gorg! Several different colors and a perfect range of mattes and shimmers! I go to this palette quite a bit and Lord knows I have way too many to choose from! Is Beta-Carotene used in any of the pigments? Hi Chemquest! Thank you for your interest in our Swear By It Shadow Palette! All the ingredients we use in a product are listed on the package or the label of the product itself. For products too small to accommodate the list, a separate ingredient list is available on the display unit in the store for your convenience. Since some ingredients are known by more than one name, we use the standard industry FDA-recognized names. A review of the ingredients that are listed on all of our products or packages will alert you to the presence of this type of ingredient. We also encourage you to visit cosmeticsinfo.org for more information on ingredients! We hope this information is helpful! Hey there Khushigirl23! Thank you for trying our Swear By It Shadow Palette. The term hypoallergenic means that an ingredient is less likely to cause an allergic reaction. However, a small percentage of the population may be sensitive to certain ingredients. NYX Professional Makeuo does not make any specific claims of hypoallergencity, although we believe our product can be safely used by most people. NYX Professional has made every effort to eliminate from its products as many of the known common sensitizing ingredients as possible. We thank you for reaching out! Hey there! Thank you for sharing with us some feedback on our Swear By it Shadow Palette . We are happy to hear that you want to try this product! You can find this palette in any major drug or retail store, or you can also purchase it on our website which can be found here: http://tinyurl.com/y6w6le9j. We hope this helps. We can't wait for you and your sister to try it! Do any of the shadows contain carmine? Hello! Unfortunately, this palette is not vegan. All of our vegan products can be view here: https://www.nyxcosmetics.com/vegan-formula. If you are looking for an eye shadow palette, we suggest our THE NATURAL SHADOW PALETTE or THE SMOKEY SHADOW PALETTE. We hope this was helpful! Is this palette gluten free? Hello! Most ingredients derived from grain sources are highly refined and retain no traces of gluten proteins. Since individuals exhibit a wide range of sensitivities to these proteins, if you have any questions or concerns you should discuss with your medical care provider. All the ingredients for our products can be found on the packaging or on our website. Any timeframe on when this palette will be back in stock? Thanks for reaching out! While we don't have a specific restock date just yet, we encourage you to check again later as inventory levels are updated daily. Thanks so much for your interest in NYX Professional Makeup. Hello! I was wondering if this eyeshadow palette contains parabens? Thank you! Hi Candice27! Our Swear By It Shadow Palette does not claim to be paraben-free. Parabens are a group of commonly used ingredients that act as a preservative in cosmetics and personal care products. They are highly effective in preventing the growth of fungi, bacteria and yeast that could contaminate and degrade products.As part of our commitment to deliver high-quality, effective products, certain parabens are used in some of our formulations to ensure the safety of our consumers. Extensive research spanning decades has confirmed the parabens in our portfolio are safe at the concentrations we use. The U.S. Food &amp; Drug Administration (FDA), which regulates the personal care industry, upholds these findings. We hope this helps! What are the ingredients of these eyeshadows? Hi anime! Thank you for asking about the Swear By It Palette. Since we have multiple manufacturers and product cycles, one product could have slightly different formulations depending on where and when it was made. As a result, we're unable to give out generalized ingredient information. It is best to refer to the product packaging for a complete list of ingredients and determine if the item is right for you. To see products in person, you can use the &quot;NYXCosmetics.com Store Locator(NYXCosmetics.com)&quot;:http://stores.nyxcosmetics.com/ to find retailers near you that carry our goodies. Thanks for reaching out!